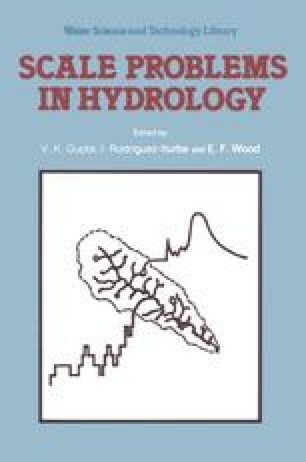 This paper stresses the dynamic nature of the hydrologic response of a small alpine catchment. The time-scale of the catchment response to an input of rainfall excess has been found to depend mainly on the peak flow rate of the surface runoff. A nonlinear model, providing for variable time-scale or lag-time, should therefore be parameterized in terms of geomorphologic and hydraulic characteristics of the catchment in order to represent the rainfall-runoff transformation. Moreover, nonlinearity is found to decrease with increasing storm intensity. The linear assumption can thus represent quite satisfactorily this transformation in order to perform major flood analyses also for “small” catchments, i.e., at the “elementary” basin scale. Reliable estimates of the bankful discharge are required for the purpose of estimating the average time-space streamflow velocity in this case.